John Langford and myself were invited to present at the Bb World Conference this year, demonstrating all the good work that Learning Services have been doing to customise and target content for our students by Faculty and Department. We thought it would be a good idea to blog whilst attending the conference so as to ensure we keep in touch with our keen blog readers and also report back whilst very much fresh on our minds! Brett demonstrated ‘template variables’ which are included in the main Blackboard platform and how he created a script that allowed the Institution to target a specific, unique to each user URL to complete a national student survey just to the students that it concerned. This then also linked into a building block that could be deployed on Blackboard to activate or deactivate it. This rings with what we are aiming to achieve with our own tabs and panels. Being able to target content to unique users is a very powerful feature and one which I hope we can investigate further. Terry is a highly entertaining Technologist with enthusiasm for analytics. He has deployed a piece of software called Piwik to help gather useful statistics and data on student use of Blackboard including (but not limited to): Visitor barometer, Real-time map, real-time visitor count, visits over time, browser use, visitor platform and browser, track users flow of page clicks (so from which internal pages to other internal pages), hot spots on pages and also break this down into the tabs and tools used. We would need to work out if it offers more than what Google Analytics currently offers us, but the dashboard looks really good and so could be a powerful tool to help educate others on the trends and habits of our users to help inform us to enhance their experience. Adam gave a demonstration of their Communities integration covering how the Institution has developed and organised their tabs and modules (panels) and also how they handle Organisations. Wilmington, interestingly enough, uses entire webpages for some of their tabs so as not to duplicate content. It would be interesting to see what our students thought of that approach and whether it would work! Overall, it was great to see very similar practice to our own occurring ‘across the Atlantic’ and we’ve picked up a few ideas that we’ll be bringing back to improve our own management and development. The main focus was on the idea of ‘The New Learning Experience’. This involves; focus on the learner; connected workflow; user experience; accessible and always on environment; and data analytics. 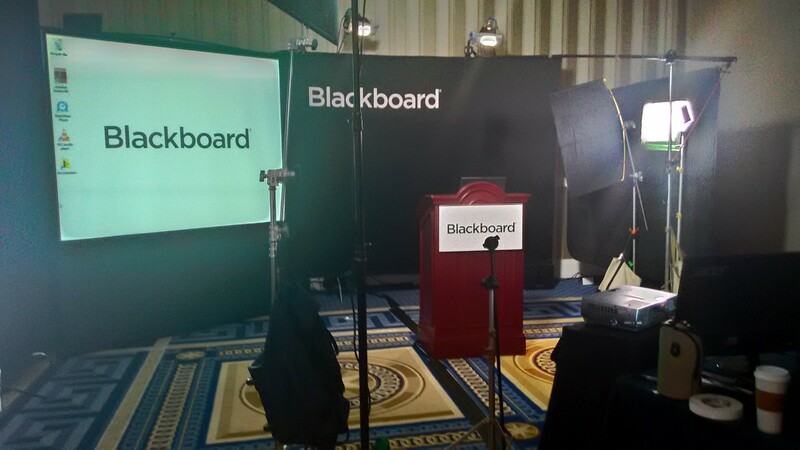 We always strive to provide the best experience for our students and of course there’s always room for improvement but it looks like Blackboard will be providing products that will support this…watch this space! Here’s a photo of the film set…I won’t post the photo of John having his makeup done – he might never speak to me again! That’s it for today – off to the Welcome Party, so more to come tomorrow where we’ll be presenting! This entry was posted in Conferences, Learning Edge by Carol Chatten. Bookmark the permalink.